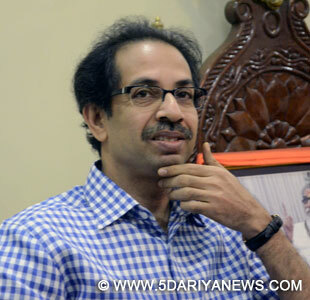 Shiv Sena chief Uddhav Thackeray Monday urged Prime Minister Narendra Modi to attack Pakistan and teach a lesson for its continued intrusions in Indian borders.In an edit in the party mouthpiece 'Saamana', Thackery said that recently Pakistan attacked 13 border villages, fired at 22 outposts in Jammu, leaving two dead and many more injured, compelling people from those villages to flee. "This is the biggest incident of its kind since 2003. In fact, in the past one month or so, Pakistan has carried out 25 similar attacks on Indian territories. But we have kept mum - like some damp fire-cracker," Thackeray said.Terming as "a matter of serious concern" the Pakistani high commissioner in India holding talks with Kashmiri separatists, the Shiv Sena chief said it is "futile" to hold any more talks with the neighbouring country. "India responded by cancelling the secretary-level talks, but that is not enough - Now, we must enter their borders and knock them down," Thackeray urged. Defence Minister Arun Jaitley has assured a suitable response to the Pakistani aggression and Home Minister Rajnath Singh has asked the Border Security Force to initiate counter-measures, he added. "Now, the country is expecting that we should set fire to Pakistan's tail and reduce it to ashes - Don't make any further delay. Act and show that this is a 'manly' country. Prove to the people of India that a 'macho' government has taken over in New Delhi. This is our plea to the centre," Thackeray added.He pointed out that around 1,000-plus terrorists have sneaked into the country to create bloodshed and the Indian army has discovered a big tunnel near the Chalka border post in Palanwala Sector through which Pakistan was planning to smuggle more extremists into India. Referring to the ongoing political developments in that country, Thackeray said Pakistan is indulging in these acts although internally it is confronting "a civil-war like situation" - people revolting against Prime Minister Nawaz Sharif and protestors even blocking its parliament. "Under these circumstances, Sharif's government is in peril and he has no idea what is going on at the borders. Moreover, whoever is heading that country is immaterial as the government is controlled by the army, terrorists, clerics and the ISI continuing to be arrogant - So nobody can predict when the Pakistan president or prime minister would be ousted," Thackeray said.